The salvaged timber frame is re-engineered and re-assembled for the house. 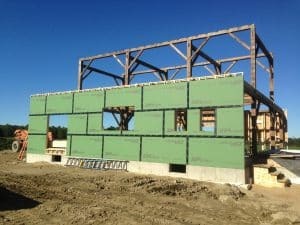 Two 2×4 walls create a 12″ cavity for cellulose insulation, and will carry the light-frame roof trusses. We were able to pre-build the wall “panels” and stand them up with the lull.